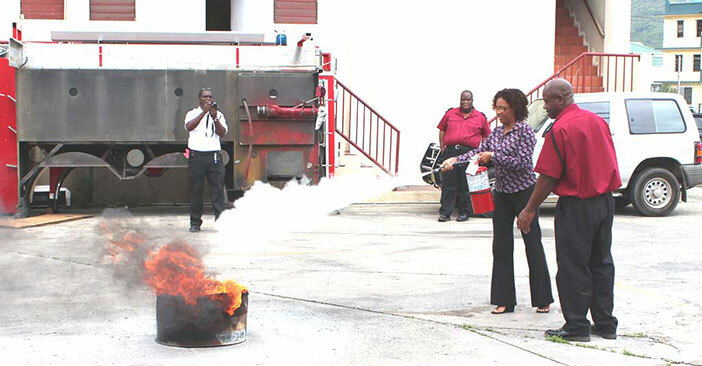 Sub Officer Geraldo Barry keeps a close watch as one of the teachers demonstrates the use of the fire extinguisher during fire suppression training, Photo Credit: Department of disaster Management. Wednesday, August 27 – An initiative by the Department of Disaster Management (DDM) in collaboration with the Training Division, the Virgin Islands Fire and Rescue Service (VIFRS) and the BVI Red Cross will result in close to 100 teachers receiving emergency training this week. The training in fire suppression and First Aid is being conducted as part of Professional Development Week for teachers, during which they are prepared for the academic year ahead. The training was initiated as part of the DDM’s 2014 capacity building programme and received immediate support from the stakeholders involved. Training in fire suppression and First Aid training is a routine component of the SAFE School programme which is spearheaded by the DDM in collaboration with the Ministry and Department of Education. Under that programme, which seeks to ensure that schools meet basic health and safety requirements, schools are assessed and must achieve a score of 80-percent or higher to be eligible for SAFE School certification. In the three training sessions hosted by the BVI Red Cross, close to 50 teachers were trained in First Aid while a similar number benefitted from the fire suppression training provided by the VIFRS.